SYNOPSIS: An ancient tradition of fishing and how it feels to watch it in the modern world as it is exploited as a money-making tourist industry. I have raised this question before, most recently with the rebuilding of Ise, so I apologize if I sound like a broken record: how much nonsensical or barbaric behavior can one justify by either tradition or religion? It is a question that permeates the 20th and 21st century perhaps more than any time before, as we have set worldwide standards through declarations of human rights, women’s rights, animal rights, prisoners’ rights, etc. Yet, here and there practices slip through which seem to either go unnoticed, and/or unchallenged; why? To me the tourist attraction of cormorant fishing which is popular in this region falls into such a category. I did not know what to expect, but I was curious. And in general I love the preservation of traditions, so I signed up. Cormorant fishing has been cultivated and recorded in this region for over 1300 years. It involves sea cormorants which are caught in the wild and then trained in captivity by a master fisherman. In Inuyama, only four of these cormorant fishers (three men and one woman) called usho, currently have the skills for this fishing method. They are trained by a veteran of 60 years in the trade. This first thing the usho does is to fill the tip of the bird’s beak so that the bird can no longer injure the usho in case of an attack. In order to prevent the birds from flying away, some essential feathers in one wing are clipped. After that, the bird is trained to swim off and to return to the usho’s boat. It is always held on a kind of a leash, a string called tanawa, which is fastened to the bird’s neck and wrapped around the body beneath the wings. The string serves two functions: it forces the bird to return when the master pulls and it prevents the bird from swallowing any larger fish, as it would naturally do, but to retain them in its neck so that it can be retrieved by an assistant in the boat. While fishing, an usho will manipulate up to ten of these strings and if you can imagine when ten birds are going off in all kinds of directions, there is indeed a great skill level not to get the birds entangled in one big mess. The usho constantly has to pull and rearrange the strings in order to keep the birds free to swim and to return to the boat with their catch. Speaking of the boat: It is called an u-bune and is quite sizable, about 13 meters, long and narrow. Three people will ultimately be on board with the birds: the usho, an assistant called nakanori, who retrieves the fish from the birds, and a steersman known as tomonori, who maneuvers and moves the boat forward. Fishing can be done during the day and for photography’s sake, I tried to join a day excursion. But you have to register a day in advance for that one. So, I joined a more typical night excursion but photography was awful and I apologize. Of all my pictures only one was halfway decent to demonstrate the process. I am sure infinitely better images can be found online. What I liked best about all this is the outfit the usho was wearing: first, a pointed black hat called kazaore-e-boshi which is both a windbreaker and a protection against the fire sparks that fly around massively once the boat is moving. Then there is the special “bib”, the muneate, which again protects against the sparks and goes over a blue fishing suit, the ryofuku, with tightly-fastened cuffs and legs. 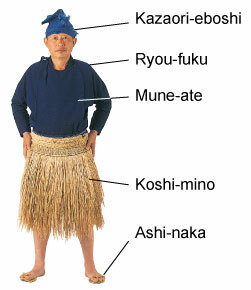 A most funky looking part is the koshimino, a straw skirt which keeps the ushu warm and protected from splashing water. Our ushu pointed out proudly, that she is making her skirt every year new from exactly 365 pieces of rice straw. Topping all this off, or should I say footing it all off, is a pair of half-sized sandals called ashinaka which prevents slipping on fish and oils in the boat. We tourists boarded a covered boat with cushions which took us first for a 1/2 tour of the Kiso River where we enjoyed Inuyama castle lit by night. For the second 1/2 our boat was floating next to the fishing boat in which the usho had lit the fire and was now edging on the cormorants to fish. There was a lot of splashing, calling, and squawking in the dark, a lot of sparks flying and the occasional glimpse of the usho manipulating her strings or the assistant pulling one of the birds who had caught a fish out of the water — by the neck — and then throwing the bird back in to the waters. I was not amused. Before our trip I had observed the two assistants preparing the birds for the trip by fastening the strings around neck and body. I did not like the looks of that. When they stuffed the prepared birds into a row of buckets in the boat by twisting (if ever so gently) their necks around so they would fit, I began to have more doubts. But now, when I had to watch how the birds were pulled by the necks and thrown back into the river, I completely lost my appetite for this spectacle. This did not seem right. Perhaps, the birds really became the master’s friends or pets as one of the brochures seemed to suggest. And yes, perhaps they lived twice as long in captivity as in the wild. But this is like saying you chop off your cat’s paws and then consider it your friend because it does not run away. Well, I know analogies are limp and this one in particular. But you get my drift. Somewhat disturbed and quite unhappy about having been a part of this tourist trap, I returned home. I completely share your sentiment about cormorant fishing. I once watched a documentary about it and was equally fascinated and appalled. The human race is ingenious when it comes to fishing practices, think dynamite fishing. Speaking of horrible fishing practices unique to Japan, have you ever watched “The Cove”? I continue to savor your blog … the slow way. We saw this is Guilin, China as well but on a much smaller scale – just one fisherman in a small boat with a few birds and in my mind I imagined the birds were rewarded once and a while for their effort and to encourage them to keep on fishing. I could not have watched this, it turns my stomach to think about treating ANY animal like that. An illogical extension, and an unfair comparison…but the horrid treatment of dogs in dog fighting came to mind. I am curious how the Japanese tourists related. Is it a cultural “toleration” that has been developed over a long time? Thanks for this detailed and honest account of your experiences of cormorant fishing. It sounds a pretty dreadful practice but I’m not sure how much of that is modern adaptation to the tourist trade and how much of the cruelty is traditional. Disappointed at the exhibition put on for us in Guilin a few years back, I asked our guide to point out less contrived examples during our trip along the Lijiang river. It was hard work trying to spot what was going on at a distance but the birds certainly seemed to have a more symbiotic relationship with their keepers. Well, after all, for a poor person they must be a valuable resource after all the trouble it takes to train them so it makes sense to look after them. That is not much experience to speak from, is it? But not so fast. I am currently taking bird handling lessons from an experienced falconer in the beautiful Warwickshire countryside, in fact I’m hoping for fine weather on Tuesday (some hope during the Wimbledon Tennis season I know) so that I can I can go “flying”. The relationship between bird and handler can be such an intimate and rewarding one but you really have to earn their respect. You will no doubt hear lots more from me about Isla the magnificent Harris hawk that I am currently attempting to bond with. Last time we were out she landed on my bare arm without hurting me – do you know just how strong those talons are? And maybe, just maybe, if we do get to the mountainous region of Northern Pakistan as we have so long promised ourselves, I can arrange to take you out “flying” too.